Gloves used to be everyday wear for women and especially on church grounds and at weddings, which exude a vintage elegance. As symbols of prestige and power, they were typically seen on the hands of royalty. In the middle ages, ladies would give them as a token of affection to her suitor, and by the Renaissance, women of fashion wore ornately embroidered gloves daily. Some even collected them obsessively, such as Queen Elizabeth I (sixteenth century) who accumulated more than 2,000 pairs! The tradition of giving gloves as keepsakes to wedding guests continued into the nineteenth century. A pair of gloves is a sophisticated accessory that signify a bride’s special status. Second only to the veil and tiara, bridal gloves send a signal about who is the significant person at the event. When a woman marries, she is special that day, a princess with privileges. One of the privileges of princesses is to be free from hard labor and using her hands. The gloves signify that she is not to dirty her hands or lift a finger. Brides also wear gloves for that extra bit of elegance and statement of fashion style. So, when considering gloves, brides should know how to choose the right gloves. Modern brides are free to utilize the customs of the past or break all the rules. 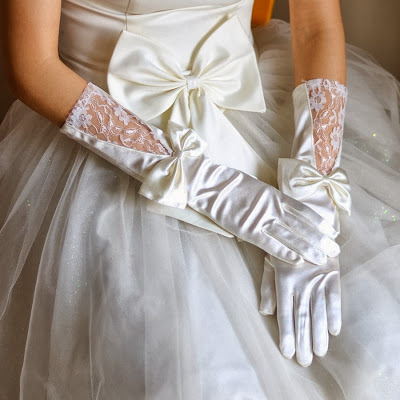 While gloves were worn every day by previous generations of women and were worn as a matter of course at weddings, today’s brides view gloves as optional. However, along with veils and tiaras, gloves are a significant signal that on this day, the bride holds a special position. Most brides choose a glove based on a style, color, and fabric that matches the gown. Since gloves are a major accessory, they should accentuate the dress style. Simple gowns pair with ornate gloves and complicated dresses are balanced by understated gloves. Brides should also keep in mind the time of the day wedding takes place, the formality of occasion, and the venue. For instance, long gloves at a beach wedding seems incongruous, but long gloves, known as opera gloves, are more appropriate at an evening wedding at an indoor venue. The most important factors in choosing gloves are the length and sizing. Most brides could safely choose a glove that goes over the wrist or just up to the elbow; these lengths will compliment most dresses and are comfortable. Standard gloves with buttons range from 1-button at the wrist to 20-buttons that end at the shoulder. The 6-button glove ends below the elbow and the 8-button reaches over the elbow. Dresses with long sleeves necessitate only short gloves. Dresses with short sleeves can bear any length up to and over the elbow. Sleeveless and strapless gowns can bear the longest length, up to the shoulder. Brides should also keep in mind that if wearing a bridal jacket, the glove length should be adjusted as necessary. Finding the right size is also important as a glove that is too tight will be uncomfortable and gloves that are too loose will be awkward. To measure for gloves, wrap a tape measure around the hand at the widest part around the knuckles, without including the thumb. Use the guidelines posted online and match the measurement. Keep in mind that brands vary slightly in size. Wearing vintage bridal gloves can be a great choice for many brides on their special day. Vintage style weddings are very popular, and brides can benefit from some of the unique styles from the past. They can find vintage gloves and other vintage wedding accessories from well-known designers or emulate style icons like Jackie Kennedy and Audrey Hepburn. They can also fill the something borrowed tradition by asking if they can wear a relative’s pair from their wedding day. Asking to wear a mother’s or grandmother’s wedding gloves will make them feel good and add a special memory to the bride’s big day. They may not match perfectly, but sometimes sentimentality is more important. Fingerless gloves are very popular among modern brides. Also called gauntlets as they are generally short and fit around the wrist, the fingerless glove allows the bride elegance and flexibility. 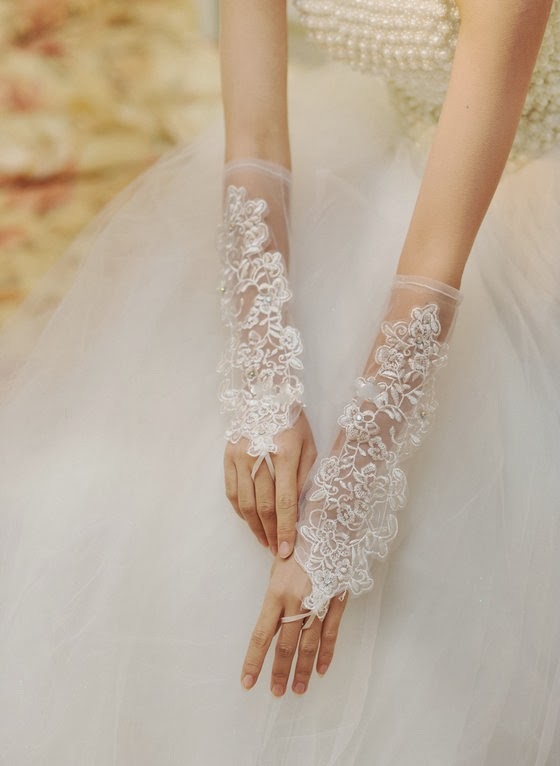 During the ring exchange, taking off the glove or making other accommodations can be tricky, so the fingerless bridal glove is a perfect compromise. The material on these gloves covers just the knuckles on the hand. Some gloves have a loop that hooks around a finger to keep the glove in place. Brides can find fingerless gloves in a wide variety of fabrics and designs. Gloves should be removed for the ring ceremony, worn or not worn for the reception line after the ceremony, worn for first dances and pictures, and removed when cutting the cake, eating, and drinking. The trickiest part of wearing gloves is the ring ceremony. Short bridal gloves are easier to remove after handing the maid of honor the bouquet. Longer gloves may be more difficult so a work-around is in order. Cut the ring finger seam so that with one small movement the finger is exposed, then have a second pair of gloves for after the ceremony. In the greeting line, brides can either leave the gloves on or off. Leaving them off will allow the intimacy of skin to skin contact when people are congratulating the bride. During formal pictures and when entering the reception room when people will be taking pictures it is a good idea to have them on especially to complete the bridal outfit. Wear them for the special dances with father and groom and for throwing the bouquet. Take them off when cutting the cake, eating and drinking. After purchasing the gloves, do spend some time practicing putting them on and taking them off. If possible, practice with the maid of honor the handing off of the wedding bouquet and the gloves. This transition should be handled smoothly and discreetly as it should not be a spectacle for the guests. It especially should not look like a strip-tease. If possible, turn the back to the guests and be sure the officiant knows that a little extra time is needed for this moment. Since the gloves will be put on and taken off several times throughout the event, practice will help the bride handle the gloves with style. While common practice is to choose gloves that complement and match the dress, and rules govern when to put on and take off the gloves, modern brides are free to make their own rules. To express one’s personality, brides should not pay attention to any rules that do not work for them. Brides do not have to pick a color, design, or fabric that matches the dress. Pick red gloves if the dress is white. Choose leather gloves if the dress is silk. Pick lace bridal gloves if the gown has geometric lines. Wear the gloves to cut the cake if desired. Take off the gloves for pictures. Break the rules and please oneself on one’s special day. After all, the central pair for the day is the bride and groom, not the gloves.